Upgrade and improve the steering and handling of your 1968-72 GM A-Body with our brand new rack and pinion kit. This rack kit easily bolts on and includes the rack & mounting bracket. This kit is designed to be used in conjunction with our various power steering pump kits with either remote resevoirs or a clip-on resevoir for short or long water pump Big Blocks or Small Blocks with long water pumps. 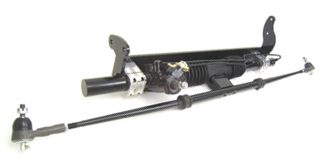 You can also select one of our steering shaft kits if you have an aftermarket steering column. Our Chevelle kits feature a black powdercoated heavy duty bracket which eliminates any twisting or flexing present in the competitor's kits.